The shiny new location, for a natural foods chain that has a distinctly upscale image, is a promising development in Englewood. The positive media coverage of the opening event was refreshing for residents of a community — once a thriving commercial center — that over decades has suffered economic and population decline, and in recent years has most often made the news because of murders and other crimes. “We have faith that this going to be a great development that creates a ripple effect,” said Leon Walker of DL3 Realty, which developed the Englewood Square shopping center at 63rd and Halsted that also includes a Starbucks that is now open, a Chipotle Mexican Grill that is still under construction, and other retail outlets. 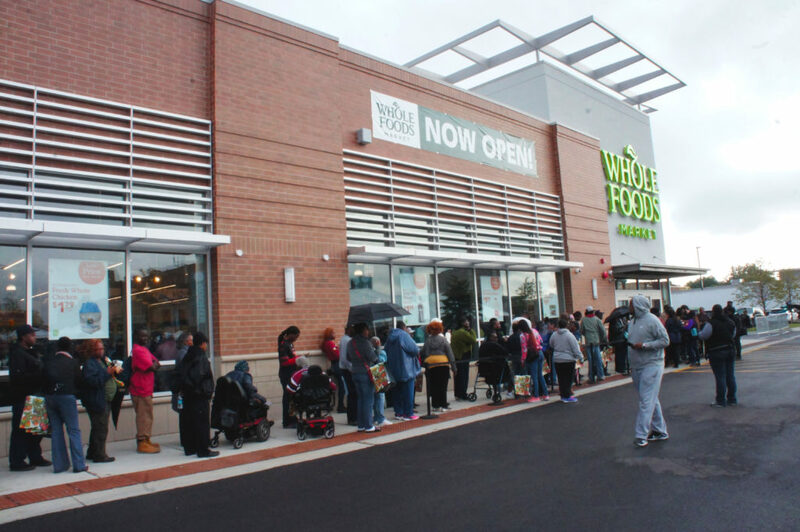 The new Whole Foods Market grocery store in Englewood is a major development in the neighborhood on Chicago’s South Side that has seen decades of economic and population decline. 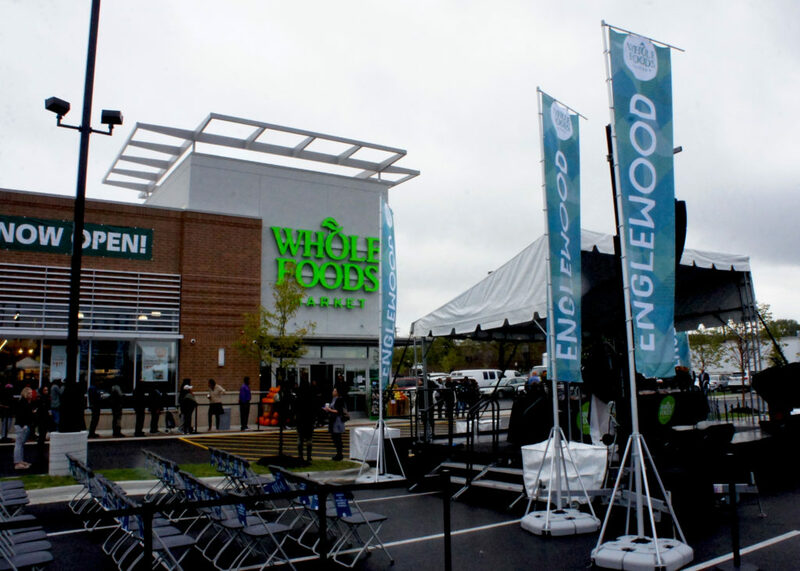 Chicago Mayor Rahm Emanuel spoke at the Opening Day ceremony for the Whole Foods Englewood store. He led the city’s efforts to persuade Whole Foods Co-CEO Walter Robb (grey jacket) and Midwest President Michael Bashaw (white shirt) to locate the store in the economically challenged community. 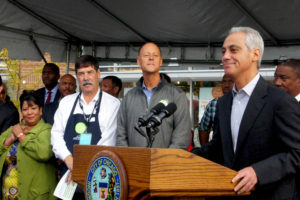 Emanuel in turn praised Whole Foods Market Co-CEO Walter Robb and Midwest Region President Michael Bashaw for responding to his outreach for the chain to extend beyond the city’s more affluent communities. “We as a city said, ‘If you’re going to call yourself a Chicagoland store, you had to be in all parts of Chicago,’ and Whole Foods answered that call,” Emanuel said. The Englewood Whole Foods also presents some challenges as well. On one hand, it challenges the notion held by some that communities that have suffered severe economic decline are beyond saving — a mindset used for many years to justify the disinvestment to which developer Walker referred. 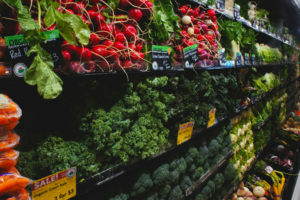 On the other hand, it challenges Whole Foods to prove that it can succeed and spur economic development in a neighborhood that has lower incomes and bigger troubles that those in which the chain typically locates. The New Deal era Federal Writers’ Project produced a famous series of state guides, and the Illinois book in 1939 described Englewood as “a middle-class community with a commercial center second only to the downtown district in magnitude.” Vintage photographs taken at night showed Englewood neon-lighted like a little version of New York’s Times Square. 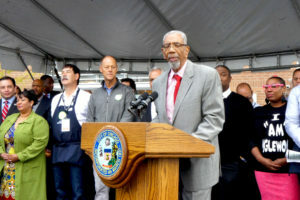 Longtime Congressman Bobby Rush recalled the days when 63rd and Halsted — the hub of Chicago’s Englewood community — was a major commercial hub. But the heavy industry that employed much of Englewood’s African-American majority declined, and the area’s economy declined with it. Population followed: From a peak of nearly 98,000 in the 1960 census, Englewood had fewer than 31,000 residents in 2010, with the greatest decline coming in the 1970s. 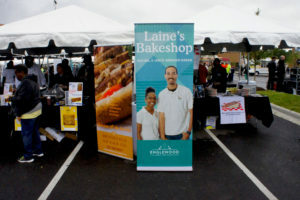 The Opening Day celebration of the Whole Foods Englewood store featured local entrepreneurs whose products are selling in the market. Rachel Bernier-Green of ‘Laine’s Bake Shop was a fellow in the 2015-16 cohort of FamilyFarmed’s Good Food Business Accelerator. That is why the 100 jobs directly created by the Whole Foods store, and another 100 by the other occupants of Englewood Square, loom so disproportionately large, especially when coupled with the fact that the Whole Foods is stocking products from 35 entrepreneurial startups on the South Side. “Let us also remember that we have a lot of work ahead of us. But now we have an anchor for our work and a foundation to build off of,” Emanuel said. It should come as no surprise that food businesses are at the heart of efforts to bring Englewood back. Certainly not to us at FamilyFarmed: A belief that locally and sustainably produced food can be a powerful engine for economic revitalization is one of our key tenets, and that is why so much of our work involves helping farm and food entrepreneurs establish themselves, scale up, and grow their companies and their workforces. The Whole Foods Market company has been a longtime supporter of FamilyFarmed’s programs, including our annual Good Food Festival & Conference and our Good Food Business Accelerator. 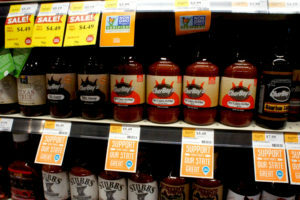 Locally made products are prominently labeled on the shelves of the Whole Foods store. Much of the emerging economic activity on Chicago’s South Side is food-related. The city’s urban agriculture sector is mostly located on this side of town. The massive Gotham Greens growing operation, located atop a Method soap factory in the Pullman community, is soon to be joined by a Whole Foods Market distribution center that the company is moving from neighboring Indiana. Even in Englewood, the Whole Foods Market store was preceded, in 2007, by the opening of Kennedy-King College, part of the City Colleges of Chicago, which includes the Washburne Culinary Institute. The school is located directly across the street from Whole Foods. Whole Foods’ decision to locate here is a bit of a gamble. But Bashaw said he has heard through the grapevine of other businesses developing plans to locate near his new store at 63rd and Halsted. A long line of shoppers, most from the surrounding neighborhood, turned out for the opening of the Englewood store. This entry was posted in Food access, Food activism, Food and community, Food Entrepreneurs, Good Food and economic development, Good Food business development, Good Food marketing, Local Food, Regional food systems, Sustainable food business investment, Sustainable food retailing, Urban farming, Whole Foods Market and tagged Chicago Alderman Toni Foulkes, Chicago Mayor Rahm Emanuel, Chipotle Mexican Grill, Congressman Bobby Rush, DL3 Realty, Englewood Chicago, Good Food and economic development, Michael Bashaw, Starbucks, Walter Robb, Whole Foods Market, Whole Foods Market Englewood. Bookmark the permalink.